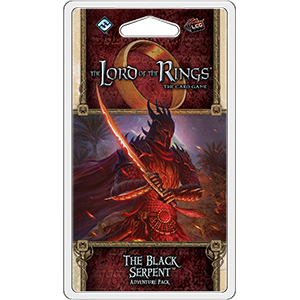 The Black Serpent is the fourth Adventure Pack in the Haradrim cycle for The Lord of the Rings: The Card Game. Its sixty cards (which include a new hero and three copies of each new player card) lead several of Middle-earth's greatest heroes along a detour from their homeward path. Even in the arid wastes of Harad's deserts, even after traveling for league upon grueling league, and even after just barely surviving their encounters with Orcs, Wargs, and giant spiders�the heroes remain true to themselves and committed to their fight against the Dark Lord. In addition to its scenario, The Black Serpent introduces a new Spirit hero with the Rohan trait, as well as a handful of other Rohan-themed cards, cards that increase the utility of your Song and Pipe attachments, attachments that grant your characters additional Traits, and a new side quest that enhances your heroes' ability to quest successfully.